This is a robust instrument designed specifically for student use which is capable of very high performance. The main structure is of heavy cast metal, with bright plated fittings. Scale : The 150 mm. diameter circle with protective shield is fixed to the telescope movement and the table is attached to the double ended vernier which reads to 1 minute of arc. Both telescope and table rotation fine adjustment screws, and release of a clamping screws enables adjustment of both movements to be made by hand. Collimator : Mounted on fixed and fitted with 178 mm. focus achromatic objectives, 25 mm. clear aperture. Also fitted is a unilaterally adjustable slit, 7 mm. long. Telescope : Mounted on moveable pillar and fitted with 178 mm. Focus achromatic objective, 25 mm. clear aperture. Also fitted is a 8x Ramsden eyepiece and a glass crossline graticule. Both the telescope and collimator have rack and pinion focussing. 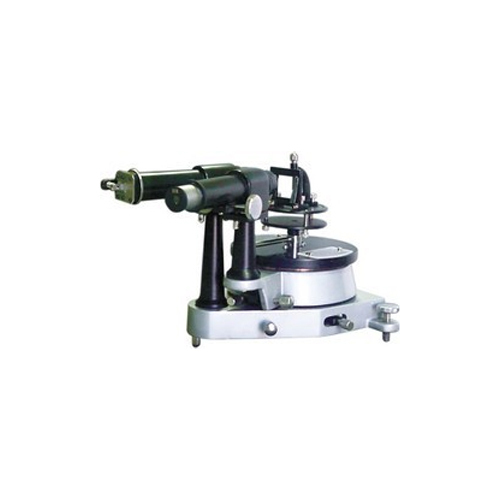 Means are provided for levelling the axis of both optical units and for squaring them to axis of rotation. Prism Table : The table is marked with lines to assist placing the prism with respect to the table levelling screws. We “Ajanta Export Industries” are a ISO 9001:2008 Certified company engaged in Manufacturing a wide range of Educational Equipments, Soil Equipments, Pharmacy Equipments, Survey Equipments, Heating and Cooling Equipments, Imported Items, Ent And Opthalmic Equipments, Hospital Furniture and Machines, etc. Incorporated in the year 2008 at Ambala (Haryana, India), we are a Sole Proprietorship firm, engaged in offering a quality assured range of products. Our mentor, “Mr. Akhil” has immense experience and under his worthy guidance we have achieved a respectable position in this domain.